This is definitely one of my favourite lines in a story crammed to bursting with priceless nuggets, and it sums up perfectly how I feel about A Springful of Winters. I had a smile on my face from the moment I started reading, and was still smiling when I reached the end. This isn’t to say the plot doesn’t have a serious side; on the contrary, one scene in particular brought me close to tears. However, the overall style is one of warmth and fun, and the humour had me laughing out loud more than once. Kit, the book’s twenty-four-year-old hero, is a true inspiration. Existing somewhere on the Autistic spectrum, he views the world differently from those around him. He needs a set routine, a series of guidelines to adhere to. Still, with the help of his trusty notebooks that contain his contingency plans for every eventuality, Kit has built a life for himself. The trouble is, when it comes to falling in love, there are no hard-and-fast rules, no instructions to follow. Which brings me to Stephan, Kit’s love interest. What a genuinely sweet and amazing young man! Where someone less patient or intuitive might have looked down on Kit for his quirks, even bullied him because of them, Stephan understands his needs and sees beyond to the beautiful, clever, incredibly special person beneath. As you doubtless already guessed, he completely melted my heart, and I only wish everyone could be lucky enough to find their own Stephan. While Kit and Stephan are both fantastic heroes, there are some truly wonderful secondary characters, too. Being the huge dog lover that I am, it’s little wonder that I fell head over heels for Bessie, the playful Beagle who is Kit’s support dog, and whose antics are instrumental in bringing these two young men together. Then there’s Yenta, Kit’s elderly but by no means frail employer and landlady, who, with her combination of compassion and forthrightness, pushes him to do more than he believes himself capable. As Shakespeare famously wrote, “The course of true love never did run smooth”, and this is certainly the case for Kit and Stephan. Their lives collide and become entangled through a series of misadventures, ranging from the hilarious and downright cringeworthy, to the tender and heart-wrenchingly poignant. Yet, whether I was doubled up with laughter over my laptop or reaching for the box of tissues, I devoured and savoured every single word. 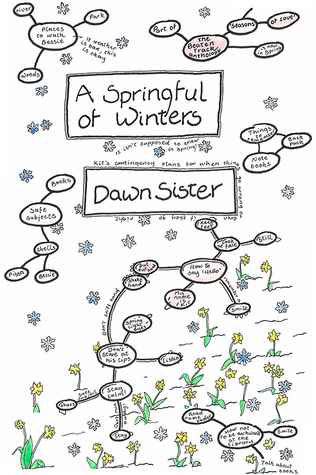 For a sweet story full of warmth, a cast of unforgettable characters, and some laugh-out-loud moments, A Springful of Winters by Dawn Sister gets 10/10 rainbows! Dawn is from the North East of England. Her life is spent juggling. The juggling balls are: children, husband, work (occasionally), voluntary work, professional knitting (notice she doesn’t class this as work), and writing. When she has time she actually sleeps. The whole point of writing for Dawn is just to get it all off her chest and out of her head. If she doesn’t write it down then she ends up having long conversations with the characters out loud and her husband thinks she’s crazy. Previous Post Check Out the Cover for Defensive Play! Next Post Defensive Play (A Boys on the Brink Novella) – Coming Soon!